Tidewater Community College is well known for its role in the community, whether taking part in such as events as Relay for Life; producing plays, concerts and art exhibitions; and inviting the public to hear guest speakers on campus. But it may not be common knowledge that TCC also prides itself on engaging with its communities by hosting organizations and events on its campuses. TCC partnered with the Downtown Norfolk Civic League to connect community members with those seeking election for mayor, City Council and the School Board. “We are excited to offer this engagement opportunity for community members,” said Norfolk Campus Provost Jeffery Boyd. On Feb. 15, City Council candidates Andria McClellan, Warren Stewart and incumbent Barclay Winn will be in the Norfolk Campus Student Center from 6 to 7:30 p.m.
On March 21, community members can hear from School Board candidates Dr. Noelle Gabriel, Carter Smith and Bob West. This is the first time Norfolk residents will elect school board members. This event will be held in the Norfolk Campus Student Center from 6 to 7:30 p.m. The final event, featuring mayoral candidates Sen. Kenny Alexander, Sheriff Bob McCabe and Councilman Andy Protogyrou will be held April 18 in the Roper Performing Arts Center from 6 to 7:30 p.m. Elections will be held May 3. 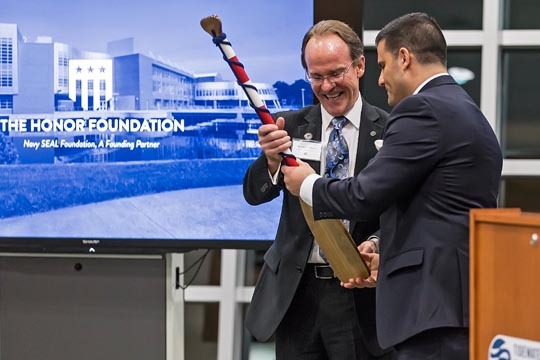 The Honor Foundation provides executive education, professional development, career coaching and transition management in support of veterans from the Naval Special Warfare community as they move into the next phase of their careers. It is based in another Navy community, at the University of California-San Diego’s Rady School of Management. But on Jan. 28, founder Joe Musselman was joined by Virginia Gov. Terry McAuliffe and Secretary of Veterans and Defense Affairs John Harvey to launch the East Coast institute, which will be located at TCC’s Virginia Beach Campus. TCC is donating the space for classes. TCC’s Chesapeake and Portsmouth campuses partner with their city’s police departments to provide learning spaces. The Chesapeake Police Department uses a designated classroom to provide recertification training for its officers. In addition, the department’s Citizen Police Academy uses the space to complete a rigorous curriculum during 11-week sessions. The Citizen’s Police Academy Alumni also meet on campus monthly. “We are grateful for the connection with have with TCC because we believe in its mission of educating the community,” said Lt. Mike Cole, training director with the Chesapeake Police. In Portsmouth, Rick James, program head for Administration of Justice, has been instrumental in building partnerships that bring police deputies and law enforcement leaders to campus for annual training sessions. An added bonus: Students from the Portsmouth Campus Administration of Justice Club sit in during the sessions. More than 100 law enforcement officers from all seven cities will take part in an all-day school safety training seminar on April 8 at the Portsmouth Campus Student Center. On May 9, the student center will host regional community policing team building. “We depend on our relationship between the college and the law enforcement community,” said James, noting many of the Administration of Justice faculty continue to work in the profession, allowing them to bring real-world examples into classroom.